One does not simply walk in to Mordor… Whelp you do. Middle Earth: Shadow of Mordor brings to life a fantasy experience of what it feels like being Rogue/Ranger in the Lord of the Rings series. Though it can be repetitive it has enough to offer to the player to keep them enjoying the game even after the story is finished. The game starts off with a brutal opening. 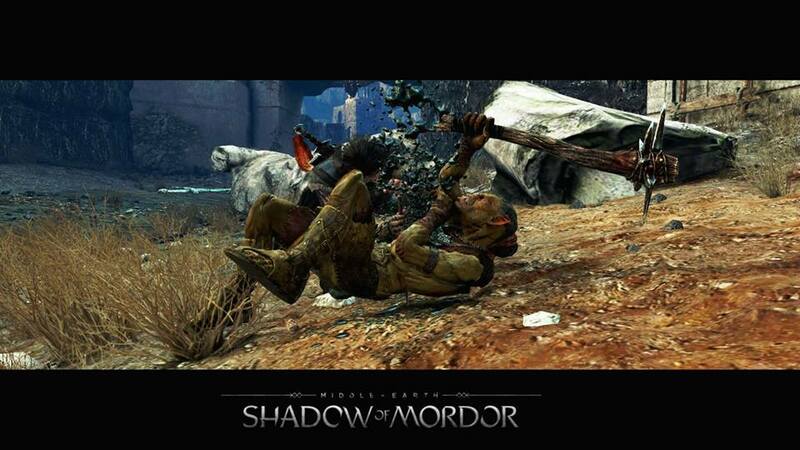 The Protagonist, Talion, is ritually killed alongside his family by Uruks (orcs) and a group of mysterious figures that are the direct underlings of Sauron himself (big ol’ red eye). Unlike his family, Talion has not been allowed to die; in fact he is very much alive. During the ritual Talion fused with an old spirit that also suffered a horrific, yet unknown, past. However what the spirit does know is who did it to him, the black hand of Sauron. Then you and you spirit friend being your quest for revenge. The setting feeling very much like the world of the Lord of the Rings and you will meet characters from the movie and book in the game. There were some plot holes and the middle and ending felt a bit rushed but it was entertaining none the less. None of the combat mechanics are new or different from any other action game. The sword combat mechanics are similar to the newer Batman games, stealth is like assassins creed, and the archery is the same as any other third person shooter. When they are put together you play as a rogue. The overall controls are very smooth but the most interesting game mechanic is the nemesis system. The way it work is that enemies become randomly generated NPC, each with their own personality, strengths, and weaknesses. Each generated NPC is also trying to become the leader (Warlock) of all other NPC (captains), and both want to see you dead. This also makes getting killed in the game fun, because right on the spot you have a new enemy that becomes a character that you now have to fight, or control. Eventually you get to a point in the game where you are able to “brand” (control) an Uruk to do you binding. It’s what makes the game fun and keeps it fresh. The only issue is that it is an upgrade that is introduced a little too late in the game. If they were introduce sooner or if the game was longer there could have been a place more strategic choices in how you would like to carry out missions. The scenery of the game is very beautiful though at times it can feel empty. The forts that you encounter are unique enough and make up for the emptiness. Where this game really shines however is in the character design of the Uruks. I have been playing the game for 38 hours and there are still new designs for Uruks that keep popping up. How they made the generator work is amazing. Aside from the character design there isn’t much difference graphics wise when compared to newer generation games. I'm an ambitious artist going under the official profession"illustrator" though I have much to learn. Ever since I was little there have been three things that influence my interest in art: Videogames, Cartoons and Comic. [Exclusive] OPPO N3 First Impressions!